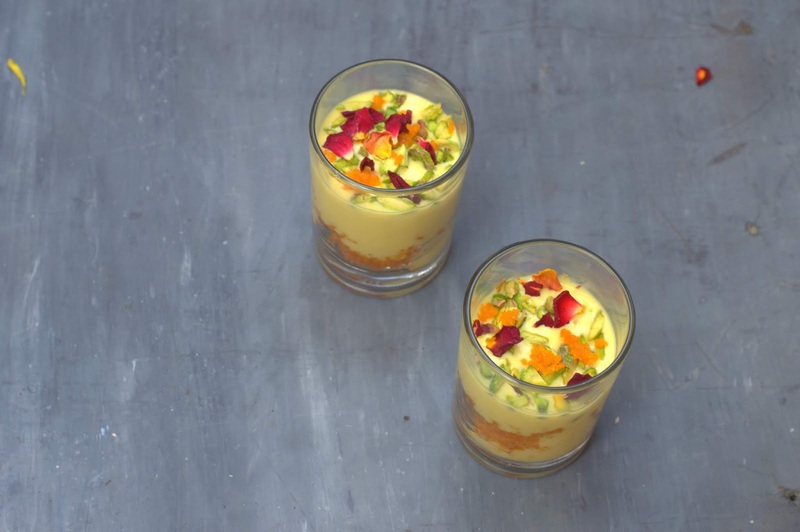 Motichoor Kesar Pudding An embarrassingly simple pudding you can make in just 10 minutes! Using store bought laddoos of course. A simple but delicious saffron and elaichi infused pudding on top of crushed motichoor laddoos garnished with toasted almonds and pistachios. Aren't these just the kind of recipes you need when you have a zillion things to do? Diwali cleaning, shopping, planning those parties, potlucks, regular cooking, home, kids, work - its never ending! But then what's Diwali without homemade sweets and desserts? For me it also makes sense to make small servings of desserts light on the palate(if not in calories) when there will be multiple things on the menu. So here comes this super simple dessert. You can of course serve just the pudding and skip the laddoos or even fill the chilled pudding in crisp tart shells if you are feeling upto it. What are you planning to make this Diwali? Do tell me! 1. Take some of the milk and soak the saffron and crushed elaichi. Let sit for a couple of hours or even overnight in the fridge. 2. 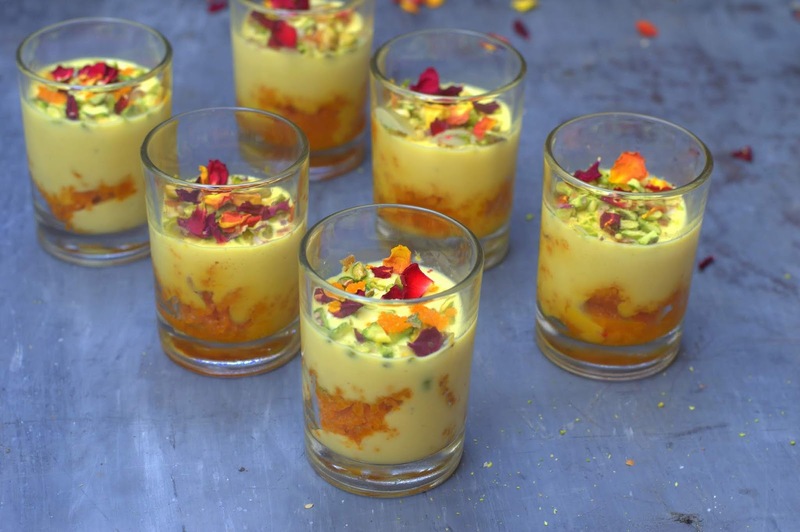 Crush the laddoos into the dessert glasses, leaving space for the pudding. 3. Take the cold milk,saffron milk, cornflour, cream, sugar in a heavy saucepan. Whisk well so that no lumps remain. 4. Whisking constantly, cook on low heat for a few minutes until the pudding thickens and comes to a gentle boil. Cook for a minute more. 5.The pudding will leave a trail when you run a finger on the back of a spoon. 6.Take it off the heat, (add butter now and mix if using) strain. Pour into the glasses. 7. Let cool completely, wrap cling film and refrigerate for 3-4 hours or overnight. 8. Top with toasted almonds and pistachios just before serving. 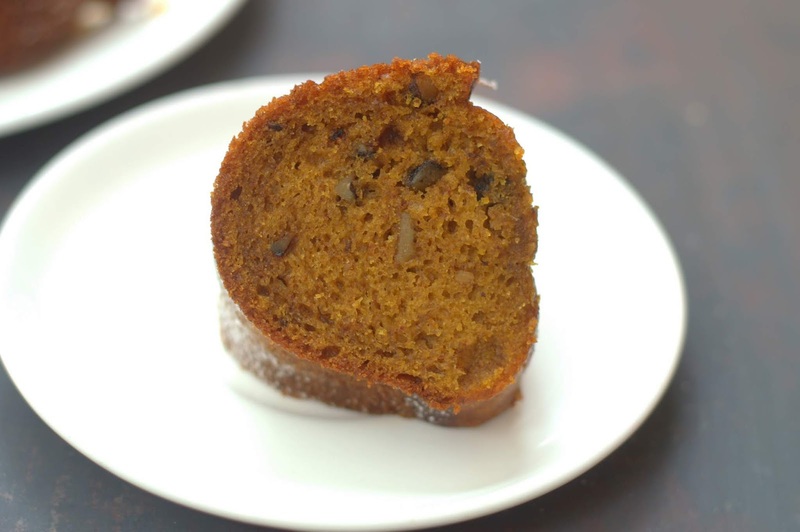 Spiced Pumpkin Walnut Cake. It's hard not to get tempted to bake one of those pumpkin things raining all around! May I suggest you give in to the temptation,indulge in a slice of this moist cake fragrant with warm spices? If you have never baked with pumpkin before,let me assure you, it is almost tasteless. It only makes your bake moist and adds some nutrition to it. So you can get those picky eaters to enjoy it as well! Isn't that a win-win? If you would be making fresh pumpkin puree for the first time, please do check my post and video here. It is a very useful and versatile thing, can be used in both sweet and savory. And I actually liked it better than the canned stuff I tried once. 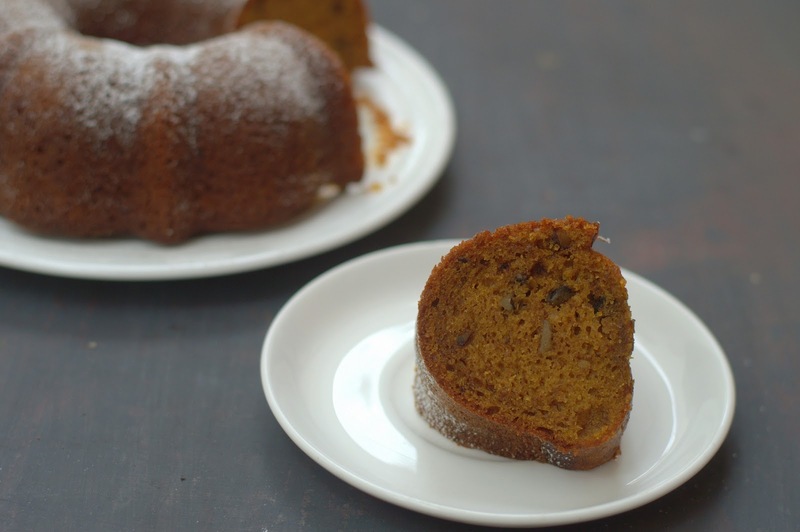 This recipe for Spiced Pumpkin Walnut Cake is from Rose Beranbaum's The Cake Bible. She calls it Pumpkin Walnut ring. She uses a combination of walnut and safflower oil as it complements the flavor of the walnuts in the cake. The recipe is very simple - simply mixing wet and dry ingredients together. 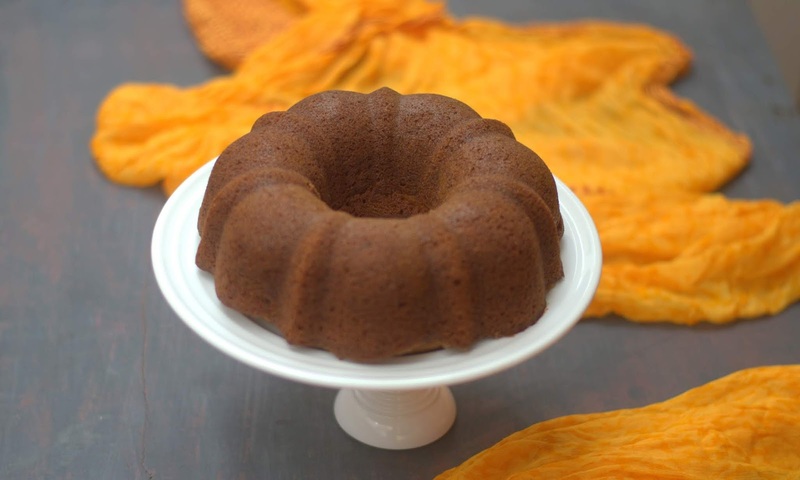 If you have your pumpkin puree ready,your cake will be in the oven in no time. Another good thing,this cake keeps well and tastes better as it sits,so great for the holiday season. Without further ado, here is the recipe. Watch me make the cake here. Do not forget to subscribe for more easy recipes and tips! Ingredients(at room temperature). Use 6 cup bundt pan, sprayed with baking spray. Variation: Skip the spices, add 1 teaspoon vanilla essence and stir in 1/2 cup chopped dark chocolate with the walnuts. Preheat oven to 180C /350F. Generously coat your 6-cup bundt pan with baking spray. Alternatively you can use some ghee and a light but thorough dusting of flour. Sift together the flour, cornflour, spices, salt and baking soda twice. Set aside . In a large bowl,whisk together the sugar, eggs,vanilla and oil (if using). Whisk in the pumpkin puree. Gently whisk in the flour mixture. When most of the flour is mixed, stir in the walnuts. Transfer the batter to the cake tin. Bake for 25-30 minutes or until a wooden skewer inserted into the thickest part of the cake comes out clean. Let the cake cool on the rack for 10 minutes. Invert and cool completely on the rack. Wrap the cake with clingfilm and let it sit overnight before serving. The flavors meld better that way. Serve at room temperature. Store airtight at room temperature for 2 days,in the fridge for 5 days. You can also wrap in cling film and freeze in an airtight container for 3 months. 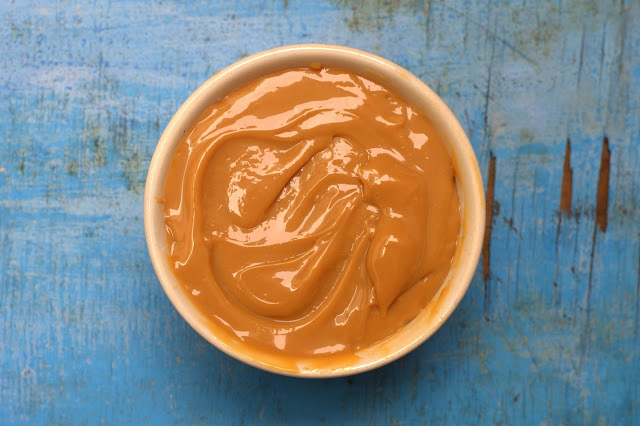 Dulce De Leche again - the safe and easy pressure cooker method! So we are all hooked to that dreamy, sticky gooey wonder-Dulce de leche! I have made it several times in the pressure cooker, immersing the sealed can in water and cooking it. Realized that it is not safe as these cans typically have BPA lining which can get ingested into the condensed milk. Ouch! That takes the fun out of enjoying this irresistible candy. I started hesitating recommending and sharing my blog post and video for making it. I eventually took the video down too. But dulce de leche is too good to say good bye to without putting up and good fight and umpteen trials. It is super versatile, amazing as it is and then your creativity is the only limit. Use in mithai, cakes,puddings, desserts and everything you can think of. I tried making it in the oven. Found it too cumbersome to get the pan in and out of the water bath without burning my fingers. And then it was not as smooth. 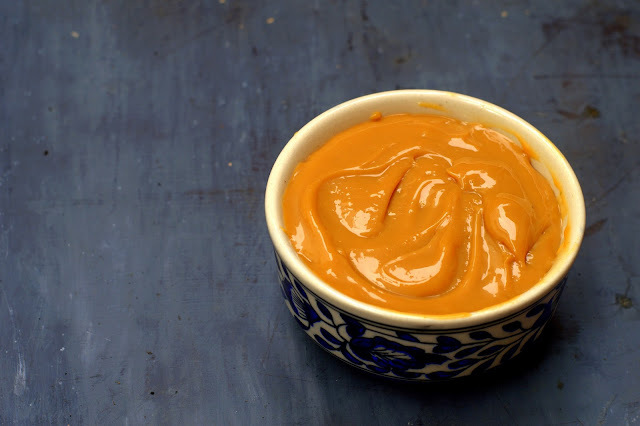 The microwave method gave me a really chewy and hardish dulce de leche - what's the fun?. But then I found my answer again in the humble pressure cooker! It is so simple, you will laugh. And then feel happy that, that is all there is to making the irresistible candy. I wonder what took me so long to look at the obvious solution staring at me since so long! Let me spare you the long story, here is what worked for me. You can watch the video here. You will need a can of condensed milk.I used a 400 gm can of Amul Mithaimate. A stainless steel can with a tight screw lid. Remember those days when our grandmothers would use it to take milk, curd etc for journeys? You can get it at a departmental store nearby. A pressure cooker. I use my Hawkins 5 liter cooker. Transfer the condensed milk to the steel can, turn the lid such that it is very tight. We do not want water getting into the can. On the outside of the can,mark the approximate level of condensed milk in the can. Take clean drinking water in the pressure cooker (just in case water gets in the can). We need the water level to be up to or above the level of condensed milk in the can. That is we need the condensed milk to be surrounded by hot water during the process. No need to immerse the can in water. Keep a heavy weight on the can ( I use a heavy marble piece). You can use anything suitable and heavy you have at home. This weight helps make sure the can doesn't tilt and fall into the water during all that rattling. Put on the cooker lid. Put the cooker on the gas stove on high heat. Once the steam starts appearing,put the weight on. Lower the heat to medium. Cook for 3 whistles and turn off the cooker. The entire process from start to finish takes 25-30 minutes in my cooker. The time may vary in yours depending on your cooker, the water level , the amount of condensed milk in the can etc. In case you do not get a whistle (or get fewer whistles) in 25-30 minutes, switch off the cooker. The dulce de leche should be done. You can try cooking it for 5-10 minutes longer if you want a more intense flavor and darker color. But do not cook for too long or the dulce de leche will not taste good. Let the pressure drop completely. Let the can remain in the hot water until the water cools off. This will help cook the dulce de leche further.In case you think you have already overcooked the dulce de leche, remove it from the hot water when the pressure drops. Once the can cools completely,open it. If the dulce de leche is not very smooth, whisk it or run it in the mixer jar. Whatever the texture and color, the taste will be great,no worries on that count. Make it once or twice,you will get an idea. The dulce de leche can be stored in the refrigerator airtight for at least a week. If you are constantly making this whenever you see a can of condensed milk, and get hopelessly addicted to it, don't blame me.